IndiGo’s first A320neo has made an appearance on the opening day of the India Aviation airshow in Hyderabad. 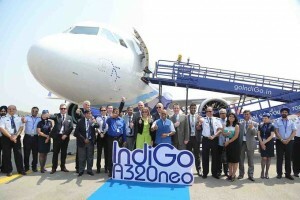 The aircraft was shown in front of Indian Government officials, IndiGo and Airbus executives as well as airshow crowds. The aircraft was delivered on March 11th after a direct flight from Toulouse to Delhi International airport lasting over eight hours (8hrs & 12 mins). IndiGo, India’s largest airline by passenger numbers is Airbus’ biggest A320neo customer having ordered a total of 430 aircraft placed in 2011 and 2015. The A320neo “new engine option” incorporates many innovations, including latest generation engines and large Sharklet wing-tip devices, which together deliver 15 percent in fuel savings from day one and 20 per cent by 2020. This is equivalent to a reduction of 5,000 tonnes of CO2 per aircraft per year. So far Airbus has won orders for over 4,500 A320neo aircraft.